The Investigative Project on Terrorism long has criticized those, like President Obama, who refuse to use terms like "radical Islamic terrorism" in the wake of jihadist violence. By the same logic, President Trump's refusal Saturday to specifically condemn by name those Ku Klux Klan, neo-Nazi white supremacists also was morally deficient. He spoke of "hatred, bigotry and violence on many sides, on many sides." Both sides did include people who showed up armed and looking for a fight, but only one side suffered death and severe injury. Moral equivalency did not belong in that moment. For proof, just read the reaction of white supremacists on social media: they thanked the president profusely for not condemning them by name. Monday's statement condemning Saturday's racist, white supremacist provocateurs in Charlottesville seemed begrudging. Yes, he finally did condemn "the egregious display of hatred, bigotry and violence" at the "Unite the Right" protests, and condemned "the KKK, neo-Nazis, white supremacists and other hate groups" involved as thugs. But starting off by citing economic gains was a non-sequitur that appeared to minimize the evil of Americans killing Americans over political differences. 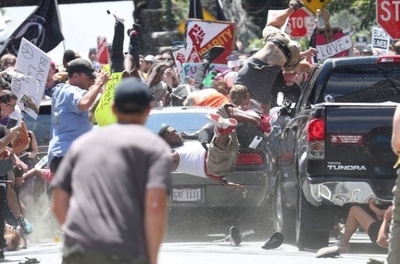 We believe that the deliberate decision to drive a car into a crowd of protesters was an act of domestic terrorism and the end product of the pure hatred spewed by white nationalists. As the Simon Wiesenthal Center leadership said, "This murderous attack, resembles car rammings in Israel and Europe perpetrated by terrorists associated with ISIS and Hamas. It should be treated as a deliberate act of domestic terrorism." It was clear even before 32-year-old Heather Heyer was struck and killed. Friday night, torch carrying bigots marched on the University of Virginia, making Nazi salutes, chanting "Jews will not replace us" and taunting counter-protesters with racist slurs. James Alex Fields, Jr.,20, is in custody, currently charged with second-degree murder and other counts. He reportedly self-identified as a Nazi. He allegedly saw a group of people who oppose his ideology and floored his accelerator. That's political violence. That's terrorism. Conservatives were justifiably outraged when the Obama administration called Nidal Hasan's 2009 Fort Hood massacre an act of "workplace violence." Most were equally offended Saturday, when President Trump could only bring himself to condemn the "violence on many sides — on many sides." The president needs to disabuse white supremacists of the notion that they have a friend in the White House, U.S. Sen. Lindsey Graham told Fox News Sunday. "I don't know why they believe that, but they don't see me as a friend in the Senate, and I would urge the president to dissuade these groups that he's their friend." When he wants to, Graham added, the president can speak with great clarity. "He needs to be clear here." Actions speak louder than words, however. Thankfully, Attorney General Jeff Sessions already has made it clear that the attack "does meet the definition of domestic terrorism in our statute," and is being investigated with an eye toward "the most serious charges that can be brought because this is unequivocally an unacceptable evil attack." It is an argument for another day, but worth a brief mention that those on the left who are outraged by the president's reluctance to name racist, white supremacist bigotry as the cause for Saturday's bloodshed would be well-served to ditch the "Islam has nothing to do with it" talking points the next time a jihadi kills. To defeat evil, you have to confront it honestly and clearly and call it out by its name. The president finally condemned by name on Monday the evil of neo-Nazis and their racist, white supremacist followers brought to Charlottesville Saturday. His daughter Ivanka managed to immediately find the proper moral clarity the first thing Sunday morning when she wrote, "There should be no place in society for racism, white supremacy and neo-nazis."